US retail ecommerce sales are expected to jump 16.6% during the 2017 holiday season, driven by increases in mobile commerce and the intensifying online battle between large retailers and digital marketplaces. At the same time, total retail sales will grow a moderate 3.1%, as retailers continue to experience heavy discounting during the core holiday shopping months of November and December. Though moderate, growth in total retail sales during this year’s holiday shopping season will be buoyed by strong consumer confidence, low unemployment and solid economic performance. Ecommerce’s share of total retail sales during the 2017 holiday shopping season will reach a record 11.5%. A big driver of ecommerce will be the continued growth of mcommerce sales—particularly smartphone commerce, which will rise by an estimated 57.8% in 2017 overall. The timeframe of the holiday season continues to lengthen. Nearly a third of holiday gift buyers polled last year said they started their shopping in October or earlier; this year, even more shoppers will start early. Consumers expect variable fulfillment options, as half now buy online and pick up in-store. Voice-activated virtual assistants are also influencing holiday shopping, though mainly as a search tool as it’s still early days for the platforms. Ecommerce continues to consolidate around marketplaces, with Amazon in the clear lead, followed by eBay. Walmart, however, is competing hard to catch up. 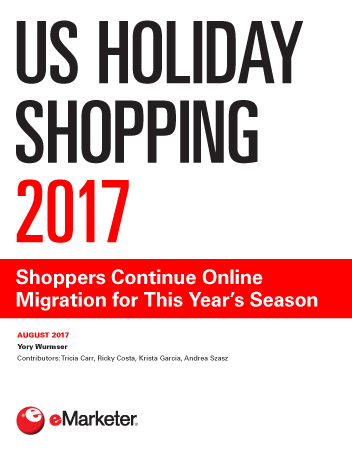 "The anticipated 16.6% growth in retail ecommerce sales in the 2017 holiday season represents an increase from 2016 as well as a growing gap to the moderate growth in total retail sales."